Concerns mounted Saturday about the medical and psychological health of 150 migrants who were spending their 10th day stuck aboard an Italian coast guard ship while the government insists that other European Union nations must take them. The standoff prompted an impassioned appeal by the UN refugee agency's chief to Italy to let them disembark and to EU countries to take responsibility for the asylum seekers, most of them young men fleeing harsh conditions in Eritrea. UN High Commissioner for Refugees Filippo Grandi, speaking in Geneva, said it's time to end a "race to the bottom on who can take the least responsibility for people rescued at sea." He urged European countries "to do the right thing and offer places of asylum for people rescued from the Mediterranean Sea in their time of need." Meanwhile, Sicily-based prosecutors took their investigation of the migrant standoff to Rome. Prosecutor Luigi Patronaggio on Saturday reportedly questioned several interior ministry officials at the Italian capital's prosecutors' office. Salvini, who leads the anti-migrant League party, has said he's ready to defend his reasons for ordering the migrants kept aboard. "If someone wants to investigate me, investigate me," Salvini tweeted. Prosecutors would have to seek the government's permission to question a minister. Local Italian Red Cross official Stefano Principato told reporters that Italy's health minister ordered an inspection of sanitary conditions for the migrants, who have been sleeping on the ship's deck and coping since Aug. 16 with a baking sun and limited toilet facilities. 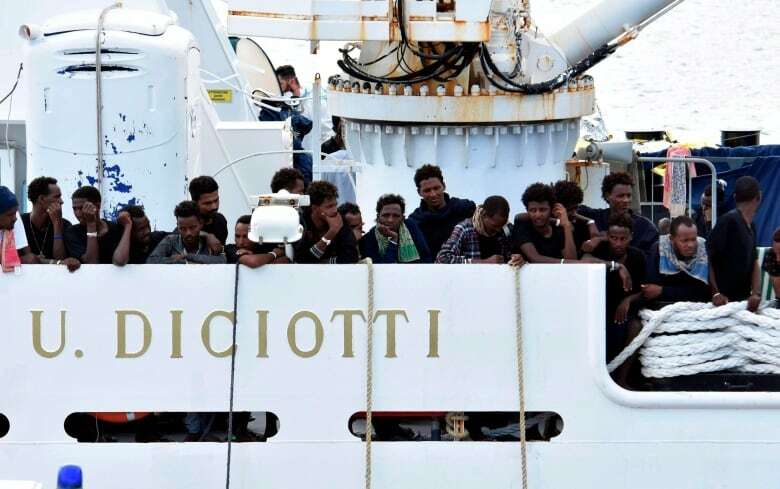 After the inspection, Catania's maritime health office ordered immediate disembarking for all 11 women aboard and five of the men, including two with suspected tuberculosis, the Italian news agency ANSA reported. Doctors have said many of the migrants on the ship have scabies but "more than a health emergency, it would be better to speak of a psychological emergency," Principato said. Many of the migrants, including 27 unaccompanied minors who were allowed to disembark earlier in the week, have told Italian authorities they endured beatings and other cruelties while in Libyan detention facilities for months or even years, waiting to leave in human traffickers' unseaworthy boats toward Europe.